With Life Strategies, Phil McGraw helped hundreds of thousands of people take responsibility for their own actions and break free from self-destructive habits and situations. Now he turns his honest, unflinching eye toward relationships -- diagnosing them, repairing them, and maintaining them. This hands-on audiobook is for people who realize their relationship is in trouble, but who don't want to give up on it. Dr. McGraw helps get relationships back on track with clear action-oriented steps for reconnecting partners. Relationship Rescue offers readers the chance for further happiness through meaningful, fulfilling relationships. This book has some amazing tools that you can use to make your relationship great. This really is an excellent book. I have to admit that I am a fan of Dr. Phil, so I'm not put off by his style. This may not be the case with some readers. But with regard to the content, I found the book to be both insightful and practical. Any reader will find parts of their beliefs in the section on Relationship Myths and parts of themselves in the Bad Spirits. The book serves as an excellent vehicle for better understanding your relationship and opening a meaningful dialog with your partner. Other than the fact that you don't have the exercises needed in this book, therefore you don't get the full effect...but the message is there. And easy to listen to...even amusing at times. If your relationship is in trouble, and you are willing or desperate to fix it...try this. what have you got to lose? 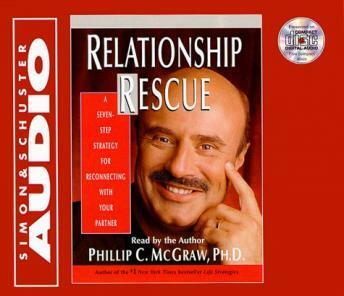 I am a big fan of Dr. Phil but I think this book is just not a good choice for audio. There were several assignments where you needed to write things down and it did not come with the workbook to do it. I think it is a great program but the audio book did not give all of the information needed to follow it correctly. It's the rarest of self-help books that actually does what it intends: Changes your behavior. I give this the highest rating because the book is very likely to move your relationship focus away from where it probably is (all the things wrong with your partner) to where it should be (what you can do today to start changing your relationship for the better). Dr. Phil is not going to let you navel gaze, and has no time for all the ways your partner is ruining everything. He's all about what you can do now, for yourself and your partner, to get things working again. This doesn't mean your partner isn't at fault too, but it does mean if you want to change things it starts with you, and it starts now. This book skips questions of who is right and who is wrong about some argument or another, and gets to the basics of why you got into this relationship, what you need from it, what your partner needs from it, and how to get back to being friends who support each other while having natural differences and disagreements. It has an unusual amount of depth and content for a self-help book, and you are likely to want to listen to it multiple times, or go buy a copy of the book itself to follow up on the extensive program laid out. It's worth it.